When a moderately huge phone just won't cut it, there's the enormous LG Optimus G Pro. This 5.5-inch monster is LG's newest Android device and it can be yours for just $79.99 through Amazon. That's even lower than the Fry's deal last month for $99.99. 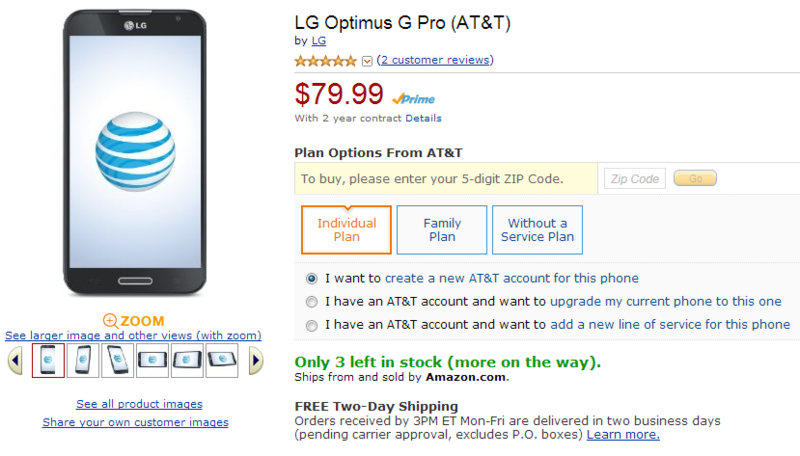 The Optimus G Pro is a step up from its predecessor, the Optimus G. The G Pro has a 1080p 5.5-inch LCD, 2GB of RAM, a 1.7GHz quad-core Snapdragon 600, a 13MP camera, and 32GB of storage. They even tossed in an IR blaster. It runs Android 4.1.2, and can connect to Ma Bell's 4G LTE network. This deal is open to all 2-year upgrades and new customers, which is a nice change of pace. You'll save $20 bucks off the current AT&T price with the Amazon deal, so hurry up. Amazon has limited stock.